A complex procedure has given an injured tawny frogmouth a new lease on life – shortening its recovery from up to a year to just six days. 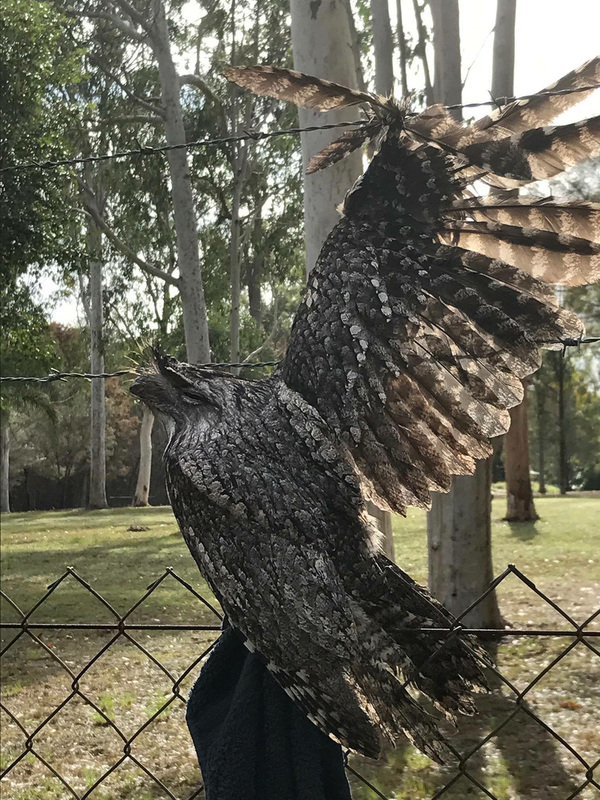 THE BIRD WAS found with its wing stuck in a barbed wire fence in the Queensland town of Jimboomba – 50kms south of Brisbane – about a month ago. After a neighbour reported the sighting, senior wildlife carer and president of Reptile Rehabilitation Queensland Anette Bird came to its aide. With the help of a fellow wildlife carer and their ute, they were able to stand on the vehicle’s tray to reach the bird, which was then sedated, removed from the fence and wrapped in a towel. 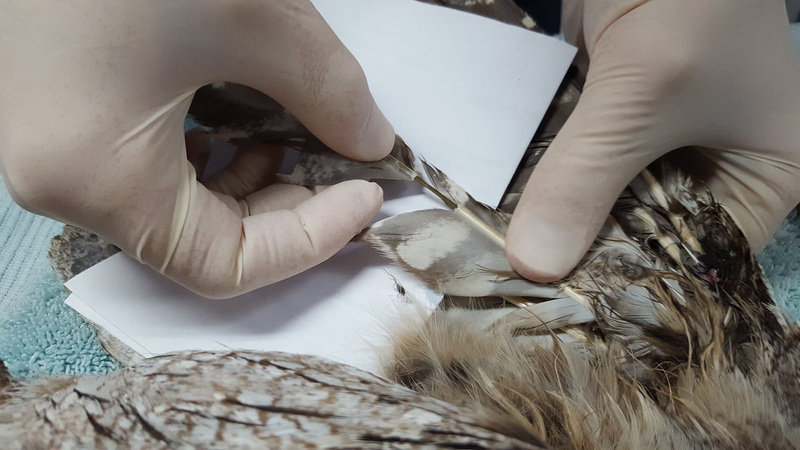 The second tawny had been hit by a car at about 100kms/hr, leaving it with severe head and wing injuries, and unfortunately had to be euthanised. 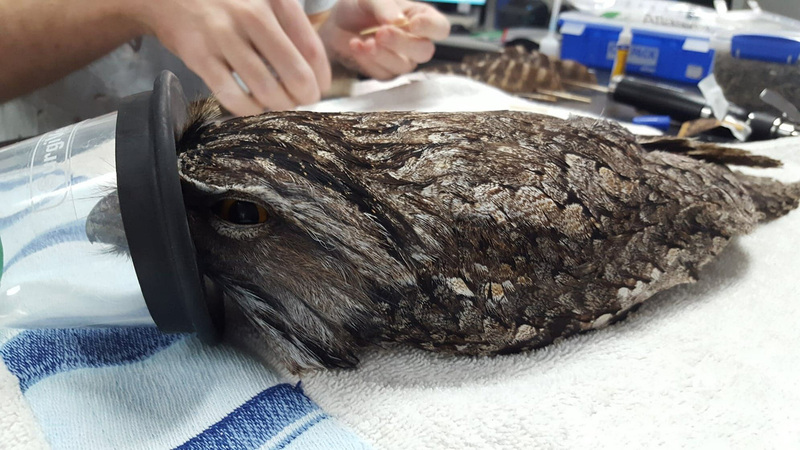 However, Brisbane Bird and Exotics Veterinary Service’s avian resident veterinarian Dr Hamish Baron was able to salvage the feathers from the perished tawny frogmouth, and undertook a procedure which saved the first tawny – affectionately named Kouro – months of rehabilitation. The procedure took around 45 minutes to transplant six flight feathers – without which, Kouro would have been looking at 6-12 months of rehabilitation while its feathers grew back. The rescue was a combined effort from five major entities – RSPCA, Wildcare Australia, Brisbane Birds and Exotics Veterinary Service, Reptile Rehabilitation Queensland and Birds Injured, Rehabilitated and Orphaned. Since images were uploaded to social media this week, the story of Kouro and the feather transplant has gone viral. Hamish, who works between Brisbane Birds and Exotics Veterinary Service, the University of Queensland, and University of Sydney, says it’s a great opportunity to pass on knowledge and teach students how to successfully care for injured wildlife.